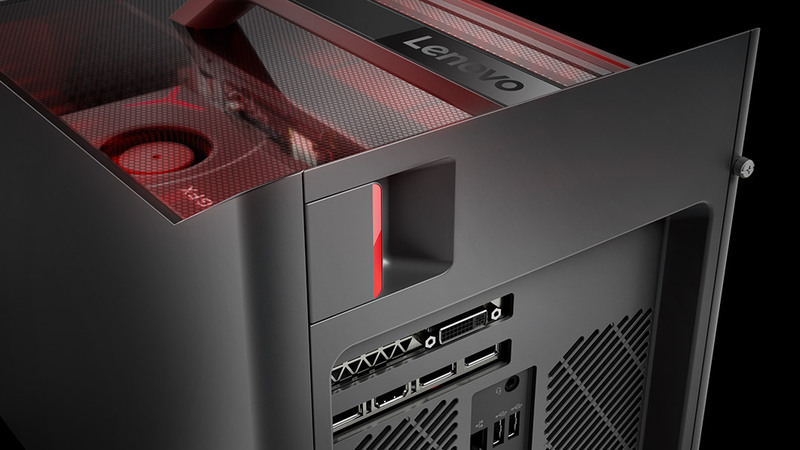 The Legion C530 is Lenovo's affordable gaming desktop aimed at mainstream gamers on a budget. It's marketed as being easy to transport, easy to upgrade, and easy to play. 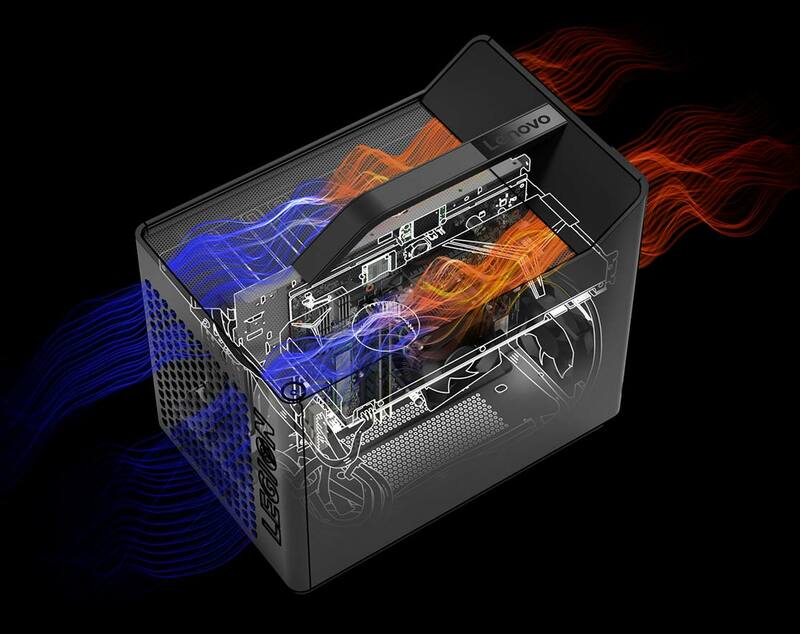 Configurations start with the Core i5-8400 CPU, GeForce GTX 1050 Ti GPU, 8 GB of DDR4 RAM, 1 TB HDD, and 16 GB Optane Memory up to the i7-8700 CPU, GTX 1060 GPU, 16 GB of RAM, 1 TB HDD, and 128 GB PCIe SSD. 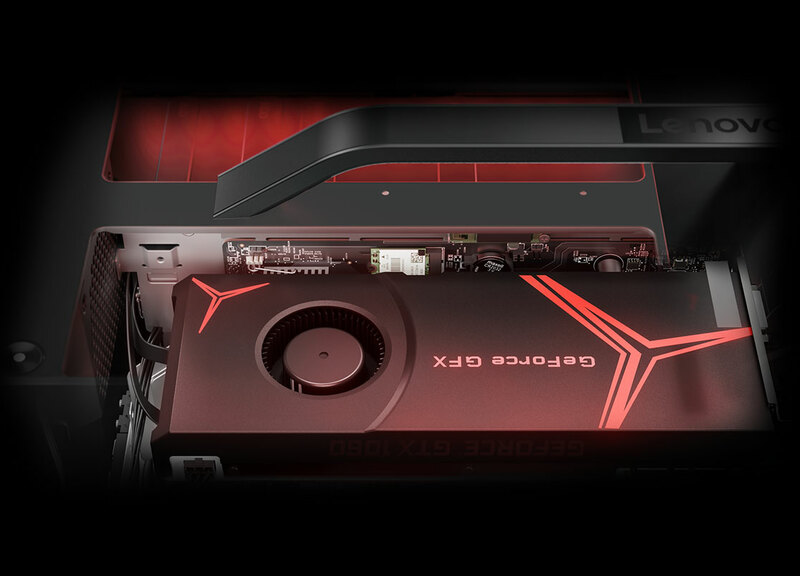 A Radeon RX 570 option is also available outside of the usual Nvidia options. 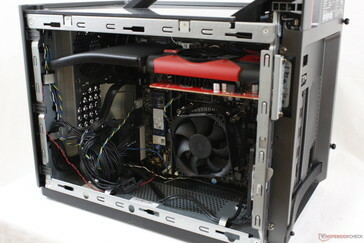 Our test unit today is the entry-level configuration retailing for just under $900 USD. 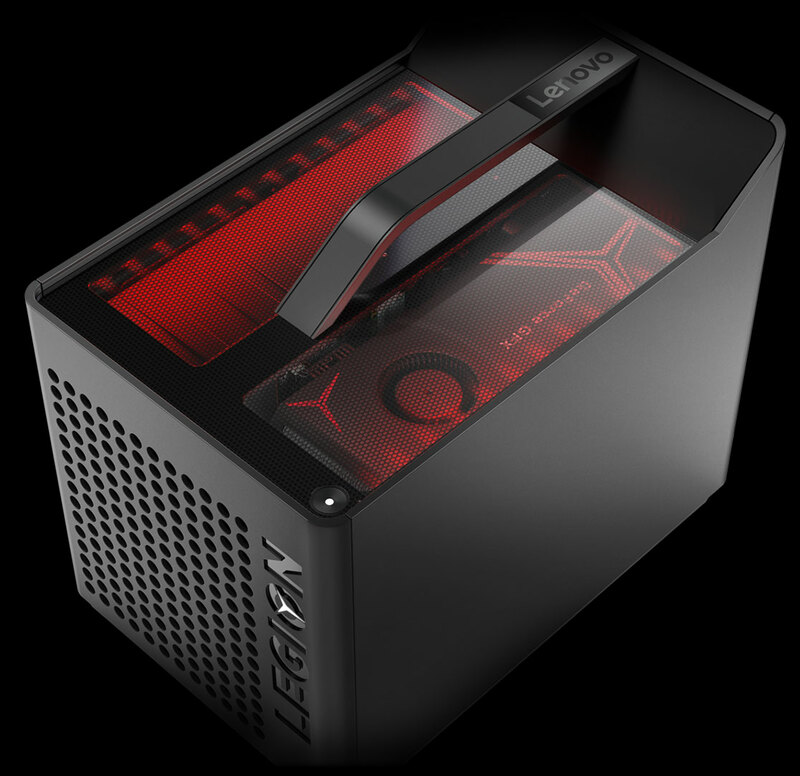 For this review, we'll be comparing the performance of the Legion C530 to entry-level gaming laptops like the Legion Y730 or Dell G3 and seeing what upgrade opportunities are possible on this chassis. Much like the Ideacentre Y720 Cube, the Legion Y520 Cube takes a no-frills approach with emphasis on practicality over sleek curves and gaudy LEDs. The large handle on top, for example, makes transporting much easier than your typical tower. 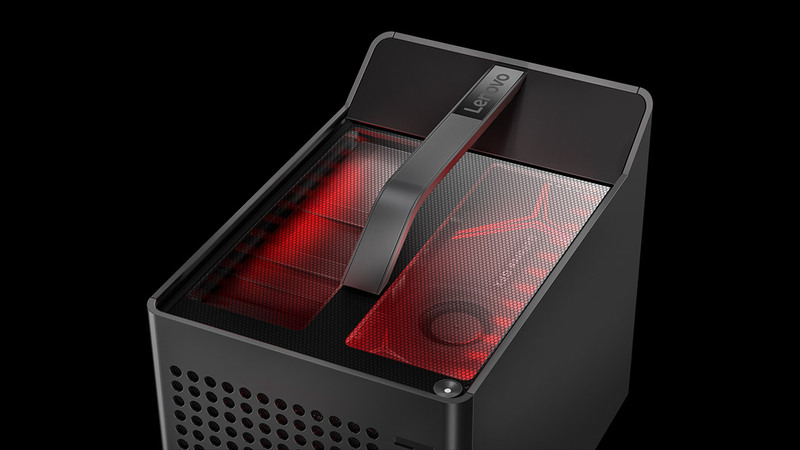 The front of the system is reserved for air intake, the rear for ports and exhaust, the clear plexiglass top window for showing off the lit GPU and motherboard, and the two easily removable side plates for upgrades and servicing. 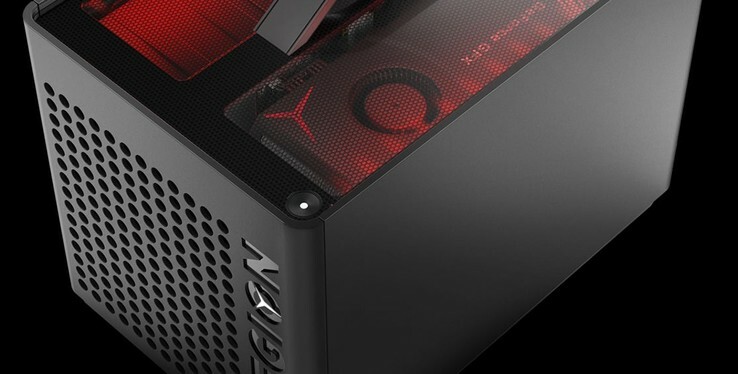 It doesn't have the looks of an enthusiast gaming PC, but we can appreciate its ease-of-use. A minor complaint about its design is that the large handle cannot be detached. Removing the handle would have made for a cleaner look to show off the internal components even better or allow room for resting more items on top of the system. Users who don't plan on moving the system around often may find the large handle to be more bothersome than useful. As for the LED lighting along the top, the color can only be customized on the C730 series while the C530 is fixed at red. 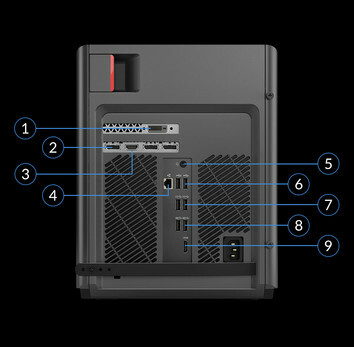 Available interfaces include 8 USB Type-A ports, three different audio ports, and a number of video-out ports depending on the GPU option. 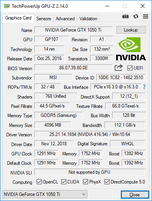 In our case, the GTX 1050 Ti provides DisplayPort, HDMI, and DVI outputs. 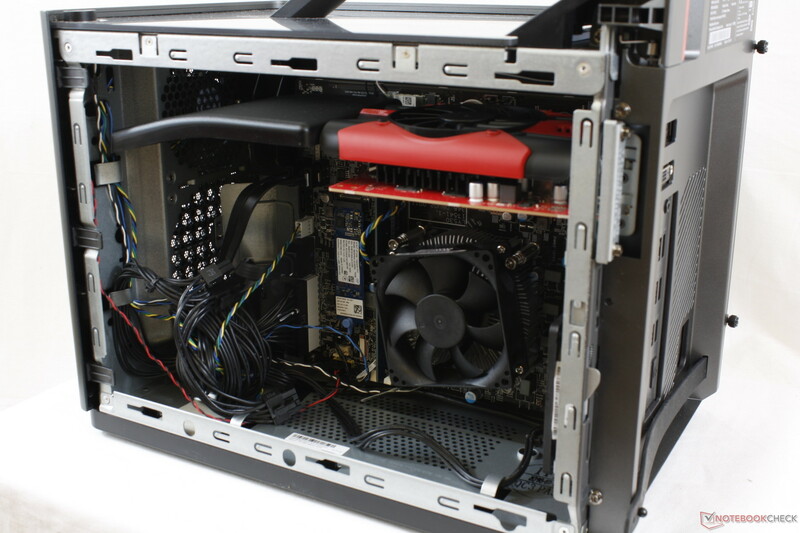 The chassis is able to accept dual-width and full length graphics cards should users wish to upgrade in the future. 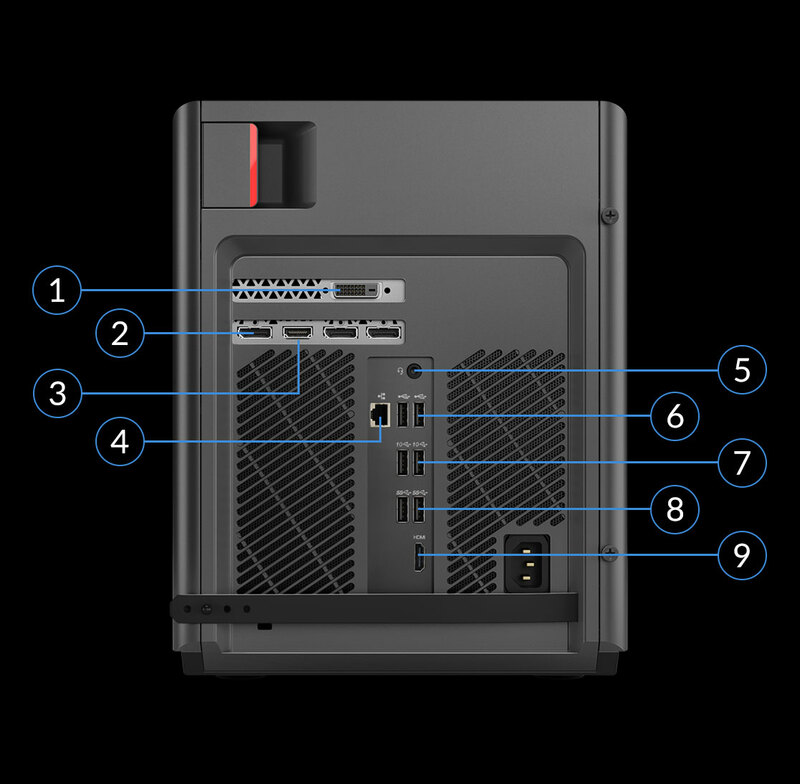 There are a number of missing ports including Thunderbolt 3, SD card reader, and USB Type-C. The latter is a head scratcher as even budget laptops and desktops are beginning to integrate the increasingly common USB Type-C port. 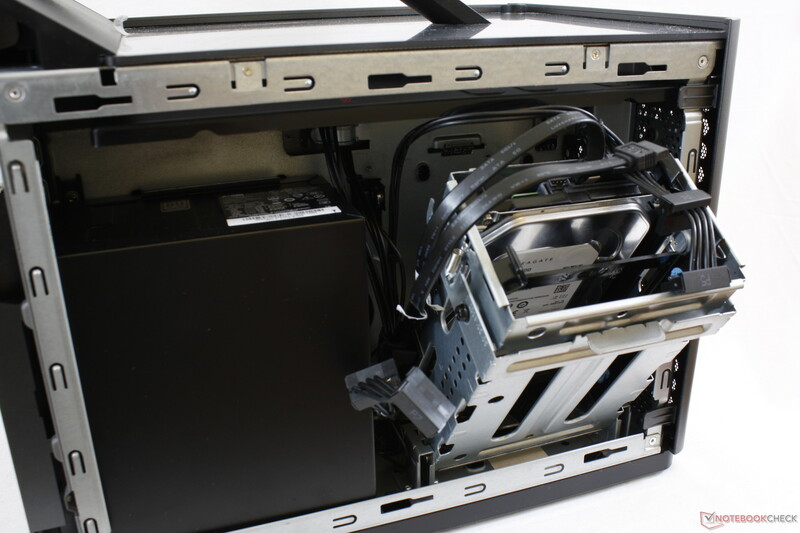 Lastly, the front ports can be difficult to reach since they are positioned so closely to the floor. 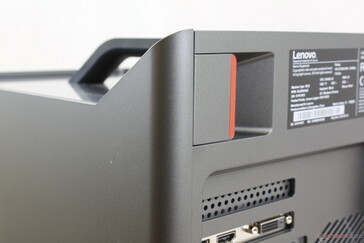 The USB ports are also upside-down that will inevitably cause some frustration down the road. 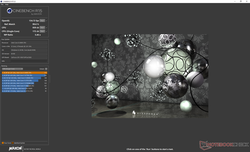 Every SKU includes a Realtek 8822BE WLAN module for 802.11ac connectivity and Bluetooth 4.2. We experienced no issues with the wireless during our time with the unit. 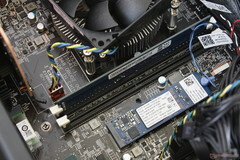 The module is removable although it will be hidden underneath the graphics card should a longer one be installed. 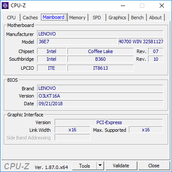 Some gaming laptops, like the Asus ROG Strix GL702ZC, are also equipped with this same Realtek module. Transfer rates are where we expect them to be given that the theoretical maximum is limited to 768 Mbps. 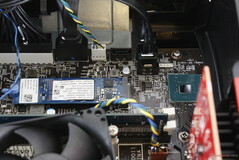 The right panel pops off with just a pull of a lever to expose the MATX motherboard. 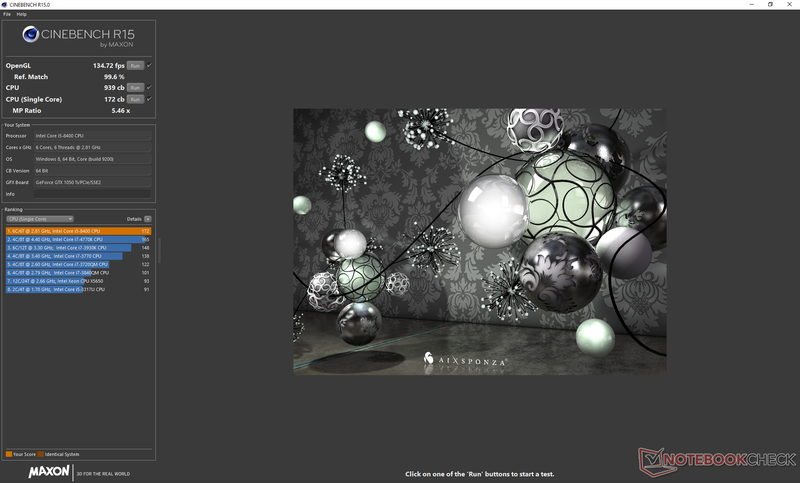 However, Lenovo says its dimensions have been reduced to 244 x 200 mm due to space constraints. 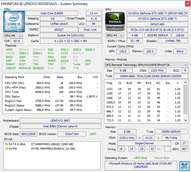 The dual DDR4 slots, M.2 PCIe slot, three SATA ports, and CPU/GPU can all be easily serviced as needed. 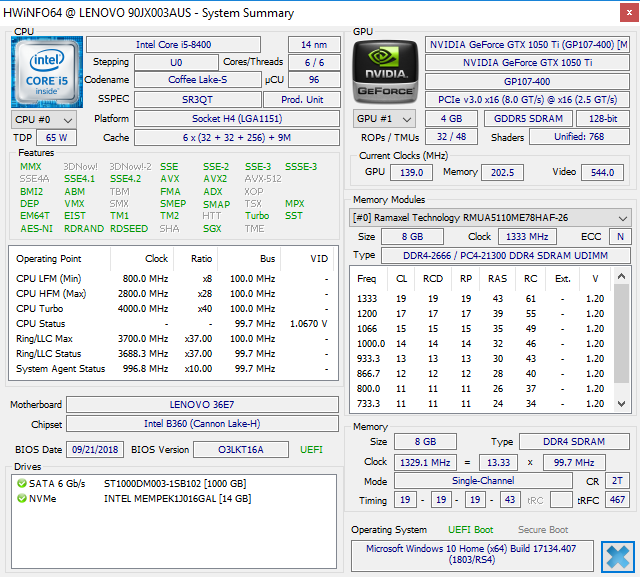 Additional 8-pin, 6-pin, and 2-pin rails are here should the GPU require more juice. 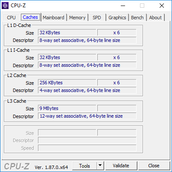 There are no other PCIe expansion slots other than the one being occupied by the GPU likely due to the limited space available. A second PCIe x1 or x4 slot would have been useful for expansion purposes. The left panel is screwed on by two large flathead screws. 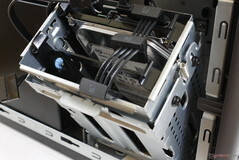 Once removed, users will have direct access to the 450 W PSU and all three 3.5-inch SATA bays. 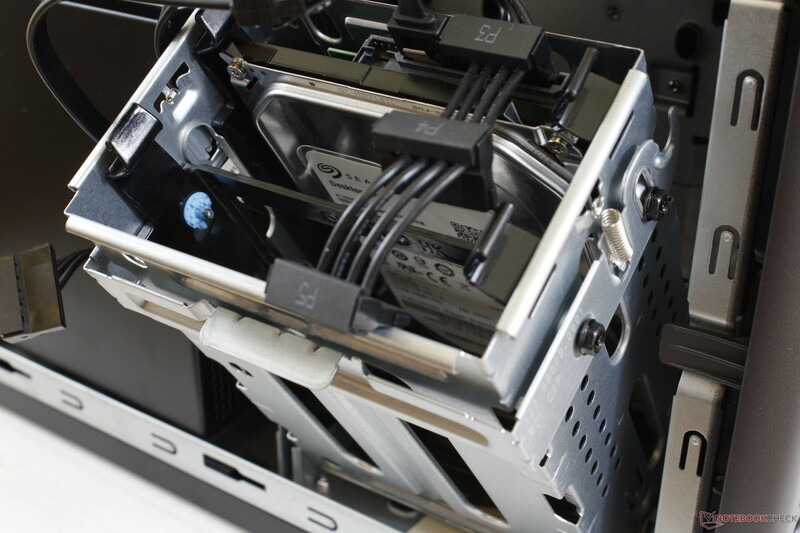 The metal mounting tray for the drives can be pulled open at an angle for quick swapping. There are unfortunately no included mounting brackets for laptop-sized 2.5-inch drives and so users will have to provide their own 2.5-inch to 3.5-inch adapters. 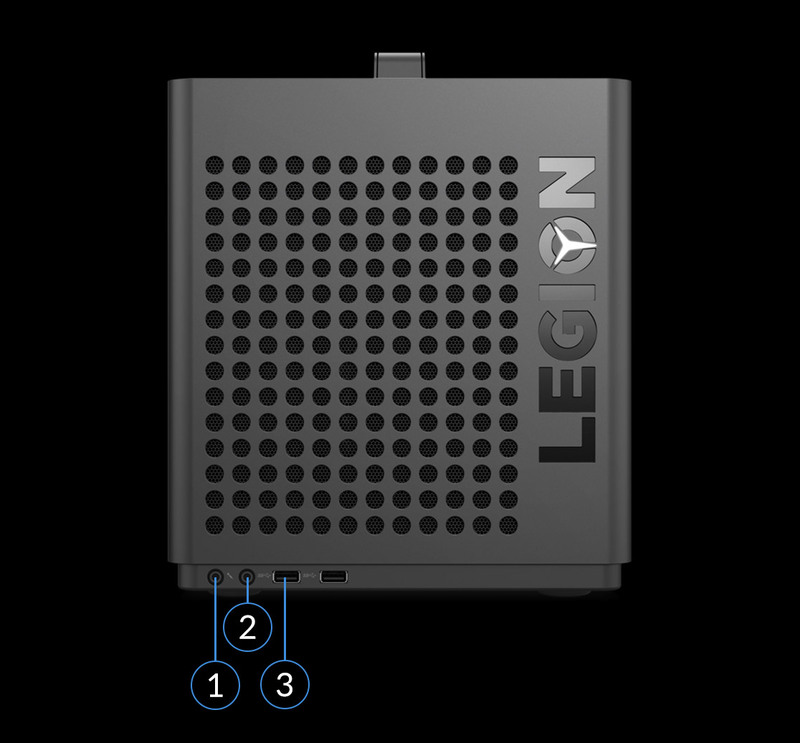 The official user's manual for the Legion C530 can be found here. Included extras are a basic wired keyboard and mouse. Thermal paste and additional screws for the motherboard would have made the package more attractive to builders. 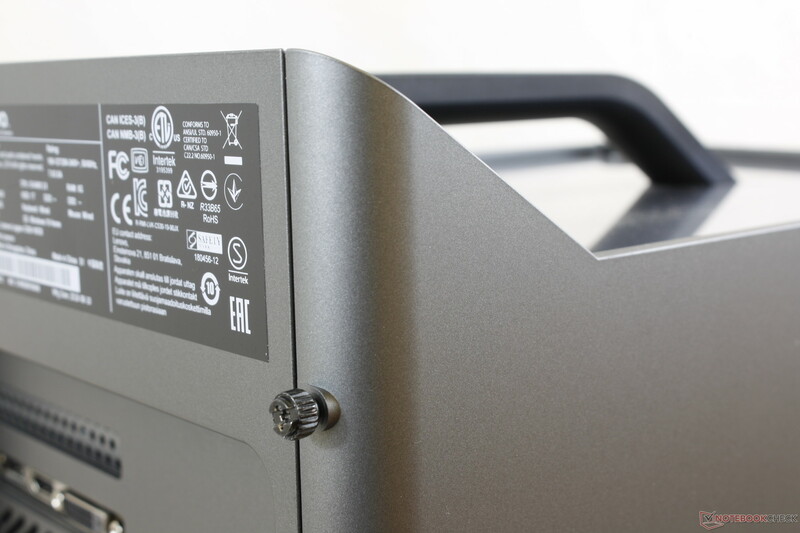 The standard one-year limited warranty applies with two-year and three-year extensions. Please see our Guarantees, Return policies and Warranties FAQ for country-specific information. 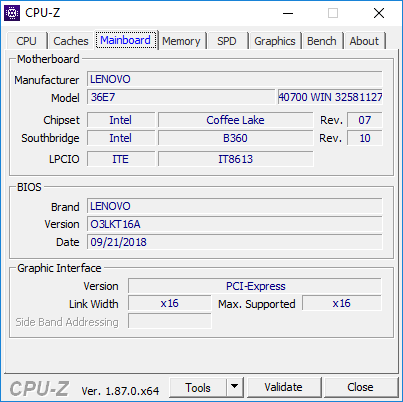 Much like how most gaming laptops can be configured with either the i5-8300H or i7-8750H, the Legion C530 can be configured with either the i5-8400 or i7-8700. 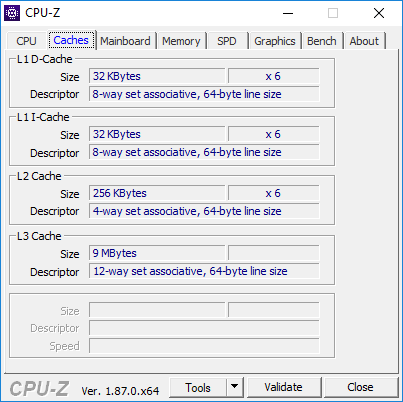 The i5-8400 is only about 15 percent faster than the i5-8300H in the Legion Y530 despite having 50 percent more physical cores. 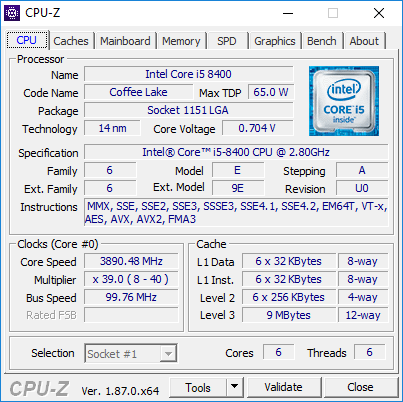 The main reasoning for the relatively minor performance advantage over mobile Coffee Lake-H is the lack of Hyper-Threading on the i5-8400. 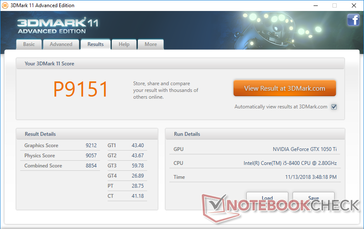 Users who choose to upgrade to the i7-8700 SKU will see a 24 percent boost in multi-thread performance. 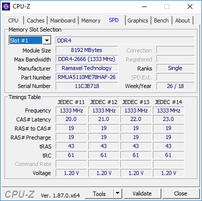 Running CineBench R15 Multi-Thread in a loop shows steady CPU performance over time whereas some Ultrabooks, like the MateBook X Pro, may suffer from sharp drops due to throttling. 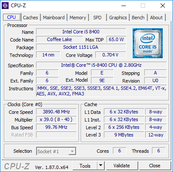 See our dedicated page on the Core i5-8400 for more technical information and benchmark comparisons. 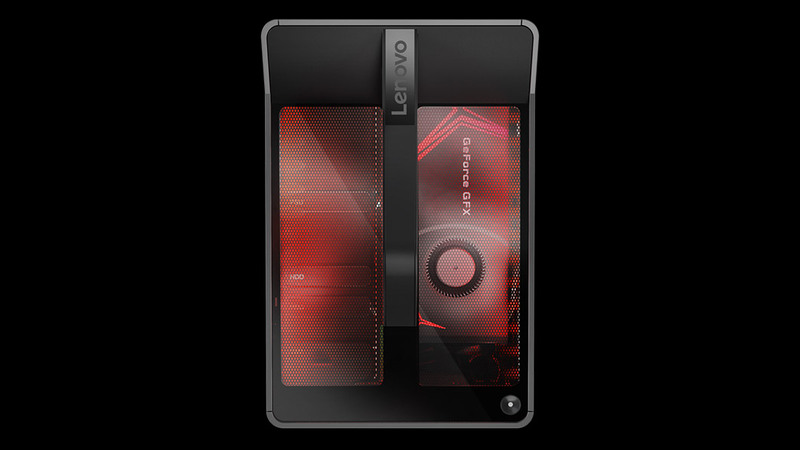 PCMark benchmarks rank our Lenovo desktop in the same ballpark as many Lenovo gaming laptops if not slightly slower because of its primary 1 TB HDD. 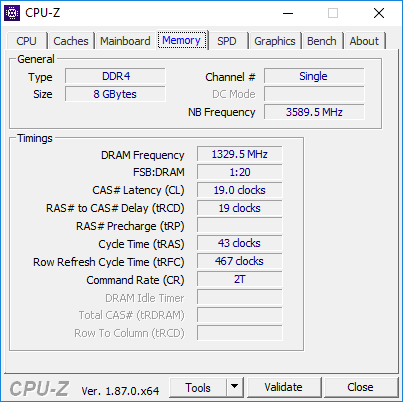 We experienced a few BSODs that seemingly went away after we disabled Optane. 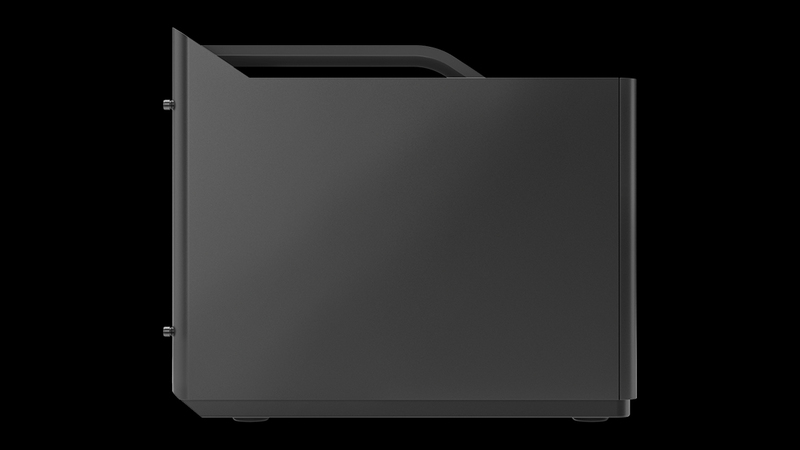 Our test unit includes a 1 TB Seagate HDD and a 16 GB M.2 Intel Optane SSD to accelerate HDD performance. 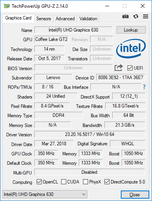 Unfortunately, our unit would not boot into Windows correctly until we disabled the Optane SSD. 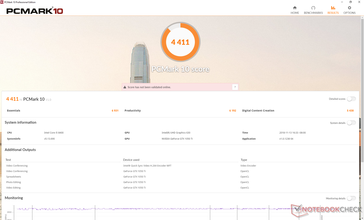 Thus, our PCMark and storage benchmarks represent the system running off the primary Seagate HDD only with no aid from the Optane drive. 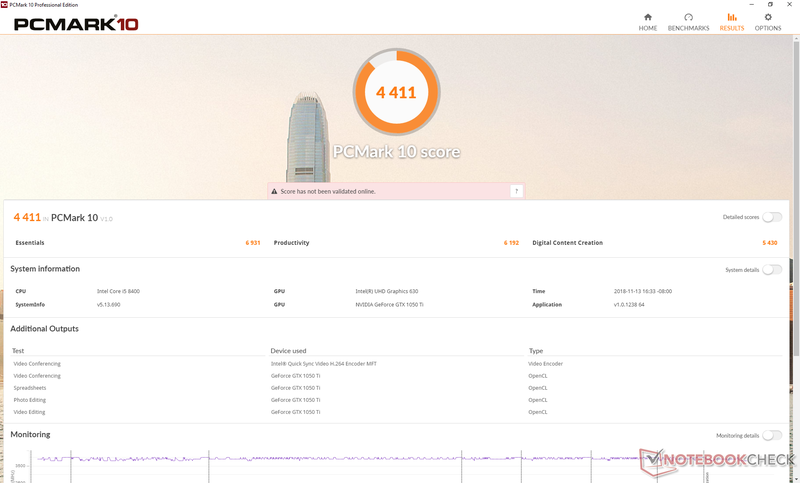 The M.2 PCIe x4 drive supports NVMe SSDs. 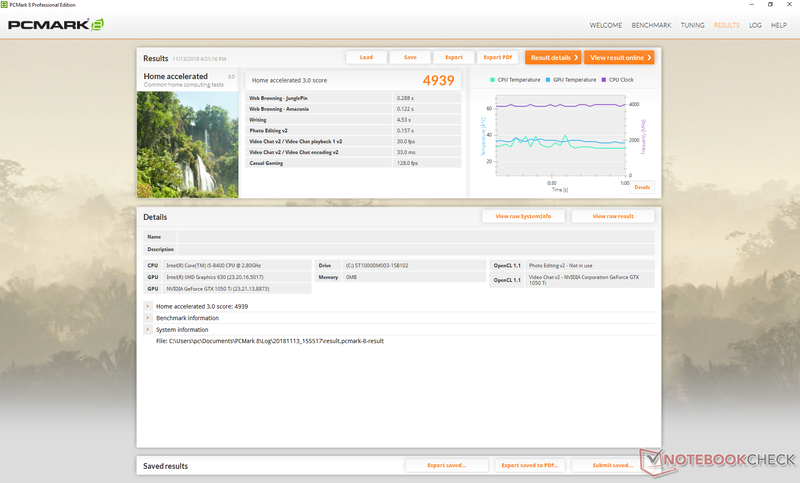 The 7200 RPM HDD returns fast read and write rates of 184 MB/s and 128 MB/s, respectively, according to CDM 5 compared to around 100 MB/s on most 7200 RPM 2.5-inch HDDs. 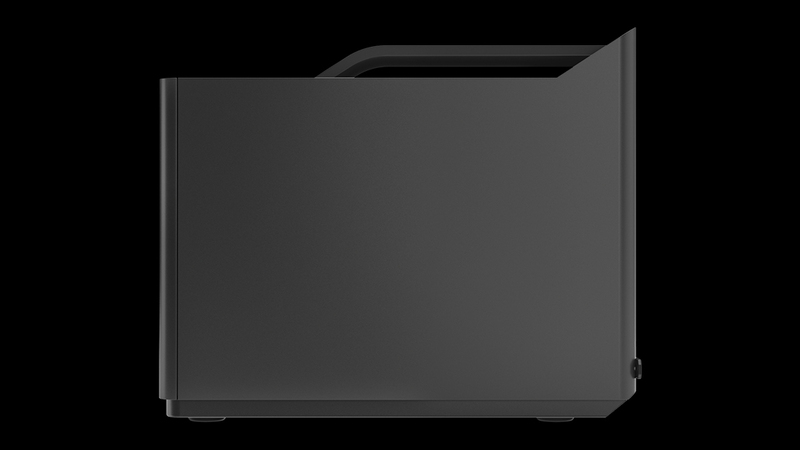 For budget-conscious gamers, we recommend a primary 64 GB or 128 GB SSD for Windows while relegating the 1 TB Seagate HDD to secondary storage. 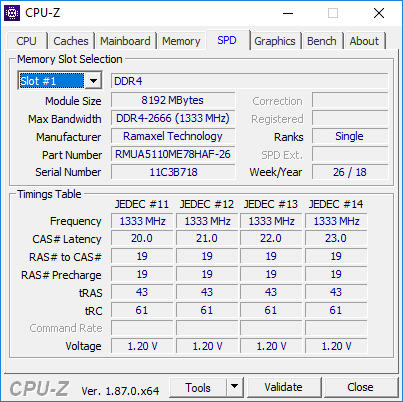 A classic SATA III SSD is still much faster than a typical HDD and less costly per GB than Intel Optane. 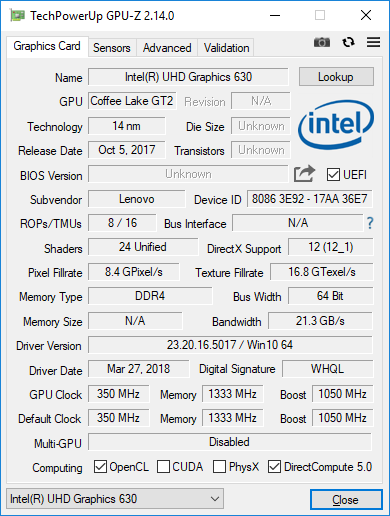 The GTX 1050 Ti has been well-documented and so it offers no performance surprises. 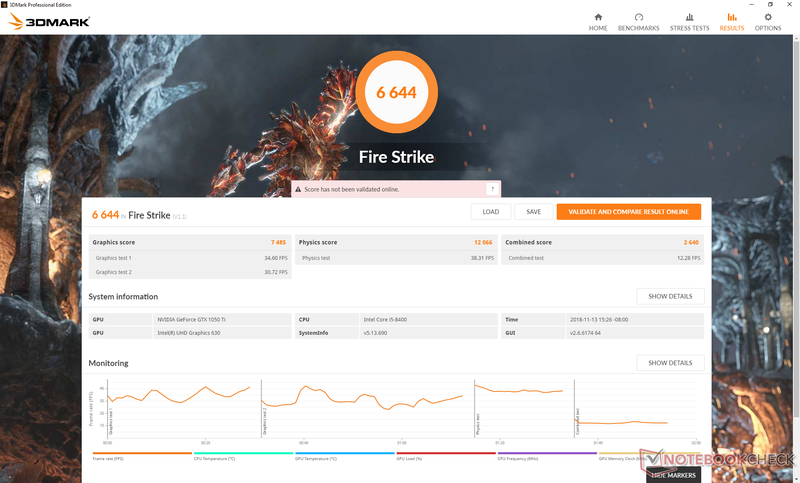 Users can expect a performance level between that of the last generation GTX 960M and GTX 970M or about 25 to 30 percent slower than the GTX 980M. 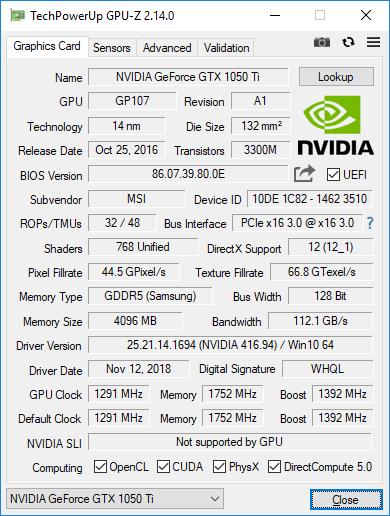 Upgrading to the GTX 1060 option will give a substantial performance boost of about 70 to 90 percent for significantly better gaming performance. There are no major performance differences between the 4 GB GTX 1050 Ti for desktop or laptops. 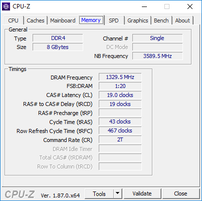 We can record no recurring frame drops or interfering background activity when gaming as exemplified by our constant Witcher 3 FPS readings below. See our dedicated page on the GeForce GTX 1050 Ti for more technical details and benchmark comparisons.